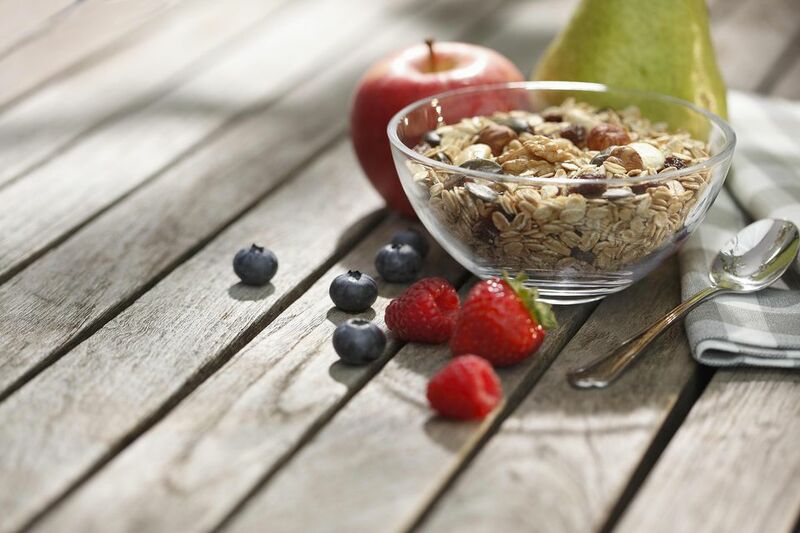 If you want to indulge in a delicious easy-to-make breakfast treat, try making toasted muesli. The best thing is that it can be made in large batches and stored for up to a month in an airtight container. The muesli is made of rolled oats combined with a mixture of nuts, seeds, desiccated coconut, honey, and a little canola oil. The ingredients are toasted in the oven for about 10 minutes. Once the mixture has cooled you can add some dried fruit, such as chopped apricots or dried cranberries. It's important to keep an eye on the toasting muesli to make sure it doesn't burn. And you need to stir it every couple of minutes to ensure it cooks evenly. Heat the honey and vegetable oil in a small saucepan over a low heat. Gently simmer for 4 minutes. Meanwhile, in a large bowl combine the rolled oats, the nuts, the seeds and the coconut. Add the warm honey mixture to the bowl and stir well to coat the dry ingredients. Spoon the oats onto a large rimmed baking sheet and spread out. Bake the ingredients for 10 minutes, stirring occasionally. Remove from oven and allow to cool. Add the dried fruit and stir to combine. Serve with milk and/or yogurt. Like this recipe? Try other muesli recipes. Honey Nut Toasted Muesli:Start the day with a mix of lightly toasted honey nut muesli. Just top with a dollop of natural yogurt, low-fat milk and your favorite berries for a delicious and nutritious breakfast. Muesli Bars: This tasty and chewy muesli bar is delicious, simple to prepare and packed full of nutritious nuts. You can add all sorts of nuts and dried fruit into the mix. In this particular recipe I use raw pumpkin seeds, sunflower seeds, desiccated coconut, dried, unsweetened cranberries and sesame and flax seeds. All the ingredients are bound together by a mixture of butter, honey and a little brown sugar. The muesli bars can be kept in an airtight container for at least a week -- if they haven't already been eaten of course!